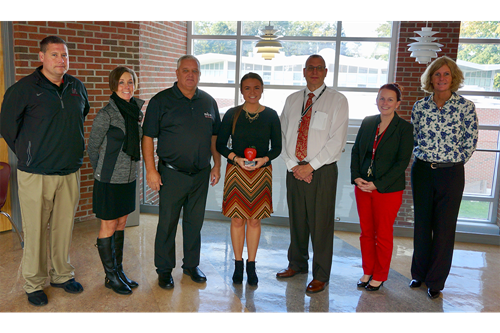 Fourth-year Newark High School English teacher Alison Charpie was awarded with the Licking County Foundation's Leaders for Learning Award for 2018. Superintendent Doug Ute, Principal Tom Bowman and representatives from the foundation presented Charpie with the award. The Leaders for Learning Award was created by the Licking County Foundation in 1993 to honor school teachers who exemplify excellence in their fields. Each year, teachers from every public school district in Licking County are selected by their principals and superintendents for their belief that all students can and want to learn; for their desire to make a significant difference in students’ lives; for their commitment to professional development; and for their outstanding classroom skills and leadership. Charpie was chosen for the award because she creates dynamic lessons in the classroom that engage students. She has helped to plan and develop professional development opportunities. Charpie is well-respected by her colleagues and always has a positive approach when presented with a situation. She looks for the solution and not the barriers.